This playground is divided by a central bridge that stretches over a "lake" of sand, creating an area for preschoolers and one geared toward older children. The playground includes a large conical climber with a tunnel and slides; a modern net climber; a variety of swings for all ages; a wooden tree house; and a concrete maze. Thin jets shoot up from the ground, and metal posts spray a light mist. A water spigot located in a sandbox allows children to mix and play with water and sand. 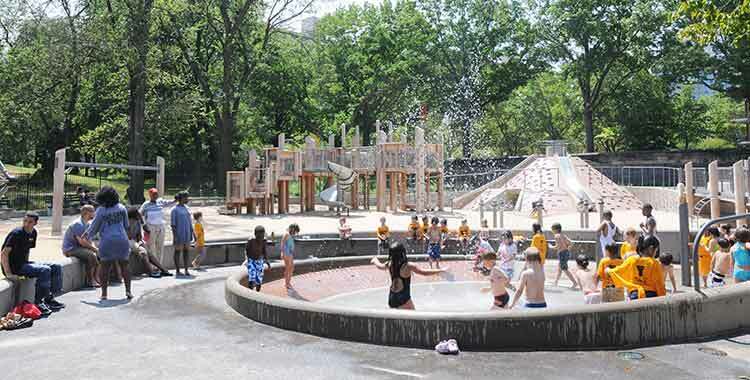 The Central Park Conservancy reconstructed the Tarr Family Playground in 2009.